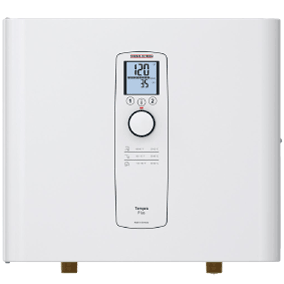 The Stiebel Eltron Tempra 24 Plus electric tankless water heater is one of our most popular models. It is a powerful 24 KW electric tankless water heater designed for moderate flow rate applications in cold climates where the incoming water temperature can drop below 45° F. It is also commonly used in southern climates for applications with high flow rate requirements up to 5 gallons per minute (large Roman-style or jacuzzi tubs, simultaneous showers, etc. ), as well as for commercial applications. Like all Tempra Plus Series tankless water heaters, the Tempra 24 Plus features a convenient dial selector which allows you to set the desired output water temperature at any level between 86 and 140F. Most importantly, it is one of the only tankless water heaters on the market that features a true thermostatic temperature control and full power-modulation based on both the incoming water temperature and the water flow rate. In layman's terms, the Tempra 24 will automatically sense the water flow rate and temperature, calculate how much power is needed to do the job, and will apply exactly that much power so it can precisely maintain the desired output temperature regardless of whether the flow rate changes or not. The Tempra 24 Plus also features dynamic Advanced Flow Control technology exclusive to Stiebel Eltron. If the heaters capacity is ever exceeded, this technology automatically adjusts the flow of water to maintain the desired temperature. This feature is particularly useful when a smaller unit than normal must be installed due to inadequate electrical service, or in cold climates. It is also desirable where high output temperatures are required for temperature critical applications (commercial dishwashers, etc.) and where flow rates are not always predictable. The result is the most precise temperature control of any tankless water heater on the market today! Thermostatically Controlled? Yes, temperature control and full power modulation based on flow rate and incoming water temperature. Advanced Flow Control Technology? Yes, this unit will automatically regulate the flow rate if it's capacity is exceeded. This feature is exclusive to Stiebel Eltron Tempra Plus Series tankless water heaters! Safety: ETL Listed (USA & Canada) - complies with both US and Canadian safety standards including ANSI/UL499 and CSA-E335-1/3E-94. Please note: A minimum 200 AMP household electrical service is highly recommended and will likely be required to install this model. If you are unsure of your electrical capacity in your home, please consult your electrician or contact us for assistance before ordering.